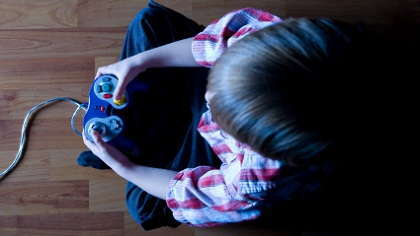 Hobby neglect and dropping grades could point to a child having video game addiction. Many video game addicts will try to practice some kind of deception about the amount of time they spend playing games, even at a young age. This kind of behavior develops as a defense of the gaming activity and can eventually lead to more general deceptive behavior. Parents who notice that their kids are not pursuing their previous favorite pastimes might have one of the warning signs of video game addiction on their hands. Observe your kid's daily activity for healthy variation of gaming and other kinds of play like sports or outdoor exercise. Another one of the most common signs of video game addiction is a decrease in grades or other evidence that a child's academic career is suffering. Many video game addicted children neglect their studies and fail to do their homework, leading to a vicious cycle where the child often falls behind in school. In general, one of the foremost signs of video game addiction is simply the amount of time that the child spends on video games and the level of insistence that he displays. Setting firm boundaries helps curb all kinds of addictive behavior for children, including an addiction to video games that can stunt a child's personal development. Many kids these days are diagnosed with ADD or attention deficit disorder, as well as its correlate, ADHD or attention deficit hyperactivity disorder. In some cases, this is more of a clinical determination, but in other cases, it can be a least partially linked to causal factors like video game addiction. Think about all of the above when determining whether your kid is at risk for addictive video gaming or similar behaviors that can prevent him from fully developing into a well rounded individual. When parents understand the signs of video gaming addiction and begin timely interventions, they can be doing their young ones a big favor. A balanced schedule is critical for building skills needed later in life, so it's a good idea to keep monitoring kids and staying engaged as parents to have the maximum positive effect.